Happy Friday, everyone! Here’s what’s been happening in the horse world this week. 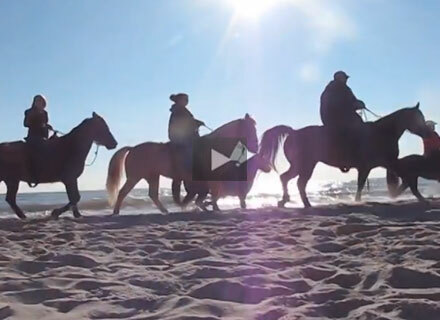 The American Heart Association Beach Ride in South Carolina has been an annual tradition for more than 30 years. Riders make their way down 20 miles along the coast while raising money for the AHA. This year, some mix up with permits caused the beach ride to stop short, although riders were rerouted to roads off the beach in order to complete their mileage goal. In any case, there are some cool photos here from the portion they were allowed to ride on the beach. Sexism in veterinary medicine? This column, written by a female vet in the UK, includes this quote from a client: “I specifically requested one of the male vets, but it is just a vaccination so I do hope you’ll be able to do that …” There are so many female vets out there, it seems insane that this sort of thing still happens, but there it is. A fascinating discovery from the horse’s past has been making the rounds this week. A nearly in-tact skeleton of a Eurohippus mare and her unborn foal from at least 47 million years ago was found in Germany. The discovery was made in 2000, but is in the news this week after researcher Jens Lorenz Franzen presented his findings from studying the fossil at the 2014 annual meeting of the Society of Vertebrate Paleontology. “Who said anything about a horse?” For some reason, Wheel of Fortune host Pat Sajak was trending in social media this week for reacting with annoyance after two contestants made horse-related guesses on the show’s puzzle. I don’t really get why this is a big deal, but I do think that “who said anything about a horse” needs to enter to American lexicon. Like, maybe you say it to your friend who keeps interrupting your story to guess what’s going to happen next. Eh, I’m open to suggestions. Manure to the rescue. A particular mushroom that grows on horse poo has been found to be the source of a substance that could be used as an antibiotic. A tragic barn fire in Michigan claimed the lives of 18 horses, a donkey and one dog on Tuesday night. Smithfield Stables was a large boarding stable and riding academy. Although the barn manager was at home with her family in the attached apartment, the smoke and flames had already become overwhelming in the barn by the time she detected the fire. The cause is still being investigated. A Facebook group has been set up to help the barn manager and her family and owners of horses lost in the blaze. And finally, there’s this satirical takedown of a new Taylor Swift video by sports site SBNation. 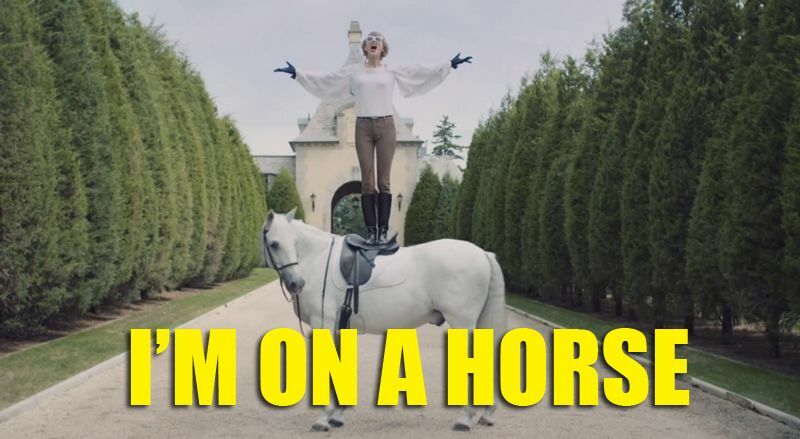 Among the sports the author suggests Swift fails at in the video for Blank Space is equestrianism, because, “You know who’s never won a horse race or an equestrian event? SOMEONE STANDING ON TOP OF THE SADDLE.” Clearly this person has never heard of Road to the Horse. That’s it for this week. Stay warm and enjoy your weekend! haha, great info! i like the Taylor Swift one! So sad about the barn fire. Astonishing about the vet!!! You know, there are many mushrooms that love horse poo!